Three variations of beloved Kellogg’s cereals debut nationwide this month. Honey Nut Frosted Flakes. Made with a blend of real honeys, it has brown-butter notes and a nutty flavor that complements the toasted corn flakes. Banana Crème Frosted Flakes. These flakes are garnished with a sweet banana cream frosting with a note of vanilla: “a banana cream pie experience in a bowl,” says the company. If they had only properly called it Banana Cream (see the difference here)! Our personal favorite of the three, Banana Crème Frosted Flakes is a limited-time offering. 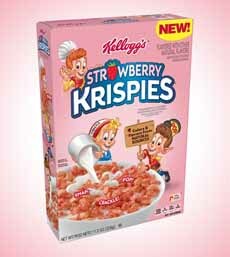 Strawberry Krispies. Snap, Crackles and Pop dress up in strawberry, a flavor requested by fans. All three flavors are fun food, even for adults. We snack from the box, add them to snack mixes and use them as an ice cream garnish. Use them to make ice cream sandwiches. For more information visit Kelloggs.com. Mustard isn’t just a sandwich spread, or a condiment to serve with meats and cheeses. Take a way at the dozens of uses for mustard). Low in calories, with spices that entice, we’re mustard lovers. There are shelves and shelves of mustard brands out there, waiting for you to discover them—especially regional mustards. Zatarain’s Creole Mustard is one of the original products introduced by Emile Zatarain in the late 1800s, and it’s been a New Orleans favorite ever since (it’s a must on a good po’ boy). It has its own “secret blend” of spices, for a vibrant mustard profile (we think we detect cayenne and horseradish). Since the brand was acquired by McCormick a few years ago, it has found national distribution. Look for it at your local market, and also browse the shelf for other brands to try this year. Discover more at McCormick.com. A coarse mustard, this one adds subtle notes of maple sugar and lemon. We’ll pick any brand off the shelf to check it out. We have so much find trying new brands, especially small, artisan ones. Snap, Crackle and Pop go for the berries (photo courtesy Kelloggs\). 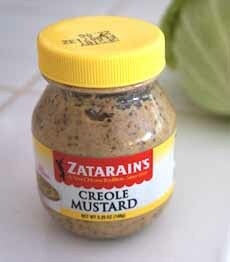 Zatarain’s Creole Mustard, a New Orleans favorite now available nationally (photo courtesy Chinese Grandma). Pick up small regional brands wherever you find them. We give them as souvenirs (photo courtesy Woogie Foods). 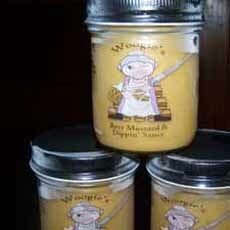 A recent discovery is Woogie’ Beer Mustard & Dippin’ Sauce from Asheville, North Carolina. From Grandma Woogie’s (woo-gee) recipe, it’s a creamy, sweet/hot cooked mustard that includes pasteurized whole eggs and a fine local craft brewed beer, Highland Brewing Company’s Oatmeal Porter. One fun way to try the different mustards is to offer four or six of them the next time you have guests for burgers, hot dogs, sandwiches, even pretzels. Don’t include the usual suspects (French’s, Gulden’s, Grey Poupon), but treat your guests to new mustard sensations. Take a look at the many different styles of mustard. Preferences differ by region and country.